We've seen the pictures of the Weapon 86 for months now but they're finally online. 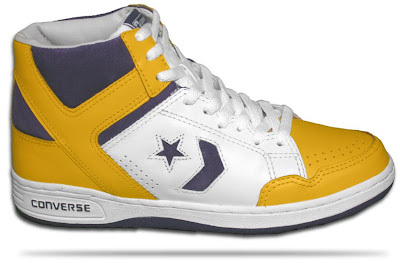 While they were up at Converse.com the other day they've since been removed, what's up with that? Anyway, you can find them at other online retailers. One of them is Classic Sports Shoes, you can find the Weapon 86 here and here. Which is where I got these pictures from, so head on over there and pick up a pair or two. The shoes made famous in the 80's by Magic Johnson, Larry Bird, and a multitude of other NBA players and college teams, can be yours. The last retros they did in 2002 or 2003 were much bulkier. I just got the Larry Bird ones last night and these are almost identical to the original 86 versions. These are more narrow and the leather doesn't appear to crack as easily as the 2002 retros. These are a DEFINITE improvement. Just got the Bird colorway too, they are may more flexable,and narrow then other converse weapons that have been released over the last few years. 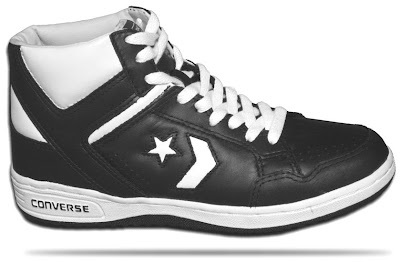 Hopefully Converse makes these permantent, simply the best style eveahhh!!!!!! !